There’s a myriad of possibilities for students to create animations. Here’s an idea for young learners, straight from our classroom, that combines hands-on practices and digital tools. 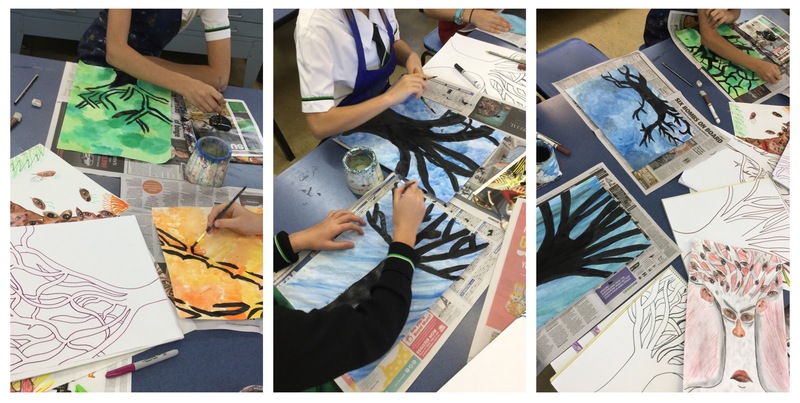 Looking at silhouettes and the difference between opaque and transparent colour, we created beautiful tree silhouettes. Thin layers of watercolour paints were applied across a sheet of paper, and when this was dry, a bold, branched silhouette shape was produced as a final layer in acrylic. The contrast between the two mediums and approaches made for some exciting discoveries about light and dark, painting techniques and the elements of art in image construction. With the painting done it was time to go digital. We photographed our tree silhouettes using the iPad cameras, then imported them into a Gif app and dropped pre-made animations on top. For Primary/Elementary students, using a simple gif cam like this can be a great introduction or hook for animation tasks. Very young learners can compare the still images and moving pictures, thinking about how the sense of movement is created as they develop a basic conceptual understanding of animation. Some great discussions evolved as we explored the moving parts of our images, especially surrounding their ideas about the function of the small animated elements on their own, and how they changes in combination with each other. The core of the learning in this activity for our classroom was in image construction. Students needed to develop a theme for their ‘Terrific Tree Gif’, using the silhouette as a base for a simple animation that conveyed a strong sense of mood or simple narrative. 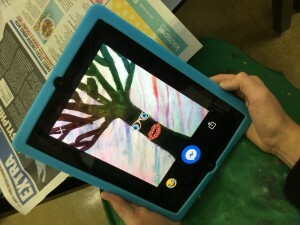 Students worked through a variety of filters for their tree paintings, thinking about the colour combinations that best represented their ideas, then used the Gif Cam app to drop in animated elements. These needed to be selected, manipulated and combined with purpose to create their animated painting. We seemed to end up with many spooky forests…maybe I should rename this workflow ‘Terrifying Trees’! Here’s the same idea in the hands of an older student. A painted image of stylised water-like shapes has been transformed into a moving image using Gif Cam animations. If you liked this post you might also want to check out our animation resources. Get started with animation here and find out how to load up the learning in animation tasks.